There does seem to be a lot of overlap on some of the questions between autistic and ADHD traits. Are you aware of the condensed AQ-10? It’s the same test reduced down to the 10 questions found to correlate most strongly with diagnosis and is officially recommended for screening by the UK’s NICE pathway. I’d be interested to know whether the AQ-10 overcomes Baron-Cohen’s bias towards stereotypical masculine aspie traits evident in the full AQ. I score 31 on the full AQ (cut off 32), but 9 on the AQ-10 (cut off 6). But then I’m overenthusiastic and extroverted, more of the ‘active but odd’ type (diagnosed with Asperger’s in adulthood). I wasn’t aware of the AQ-10. Thank you for mentioning it and sharing the links. I’ll give them a read and probably will use this for next week’s test. Maybe I can get people to share both scores here and see how they correlate. It’s really interesting that you scored so much higher on the AQ-10 than the full AQ. I just took the AQ-10 and got an 8. The questions the AQ-10 feel a little repetitive. I wonder if anyone would answer the questions about “reading between the lines” and “working out people’s intentions” differently. I would think an “agree” for one would be an “agree” for both. This could make for interesting discussion! I should say that I scored much more definitely on the spectrum on other tests like the RAADS-R (can be taken here http://www.aspietests.org/ ), but then they’re not based on Baron-Cohen’s theories. That’s a good point. 🙂 It could be. Thank you for the link to the RAADS-R. The only version I’ve seen was in a Word file and I didn’t have time (at the time) to do all of the manual scoring. I’ll take the automated version and add it to the list to post about. I’ve heard others say that it’s kind of the gold standard when it comes to AS tests. I can have a hard time telling people’s intentions BECAUSE I read between the lines sometimes. For example, if someone compliments me in a way that I recognize as a microaggression, that’s very confusing. I scored 24 on this test btw. I’m definitely neurodivergent but agree that Asperger’s doesn’t quite fit. People (professionals and laypeople) sometimes read me as aspie, sometimes don’t. I honestly found the “read between the lines” question confusing because that’s so imprecise. I’m guessing that y’all are interpreting it to mean “know the unspoken intentions behind someone’s words, not just the literal level” and even that can be pretty vague. Is it that you don’t understand that “They’re doing you a favor by pushing back the deadline” means the person wants you to start working on whatever it is immediately, or that they’re saying that to guilt-trip you, or that the person who’s saying that is secretly jealous of you for getting special attention, contemptuous of you for wasting it, and considering backstabbing you? I’d say I have a lot of difficulty telling someone’s intentions on that last level–whether or not someone’s safe. I generally assume that people are sincere and care about doing the right thing and even have a similar definition of “right thing” as me, despite many encounters proving the opposite. Now that dating a very clear abuser (once he crossed a certain line) has left me more cautious, I don’t know how to separate good people from bad people–just wanting to tell people’s intentions on that level hasn’t helped. But on lower, more mechanical levels of understanding the unspoken (was that a joke, a euphemism, a polite way of asking me to do something, etc), I generally don’t have much trouble–sometimes I take things too literally but I don’t think that’s outside the norm. It’s the latter that I’d probably interpret from “reading between the lines” and the deeper/more important level that I’d call “knowing someone’s intentions,” but I have no idea what the questionnaire writers intended. They really should’ve given examples. I suspect a substantial portion of the variance is due to differing interpretations. For another instance, I said I enjoy social chitchat but when my team at work socially chitchats, we’re generally chitchatting about linguistics or politics or something fairly intellectual like that. I know that I’ve known people in the past to assume social chitchat excluded deeper conversations like that, but currently the people I’m around generally chitchat about things like that. I took the EQ and got a 10. I have a lot of thoughts about the EQ and empathy, not surprisingly. A lot of the questions on it puzzle in regards to how they relate to empathy. Like the questions about laws and morality and politics. It will definitely be one of the tests I post about. You should! There were many questions on that test that I could not see how they related to my idea of what empathy is. I even had a conversation with my doctor about empathy, and had him look up the definition in the dictionary to prove my point: their idea of empathy is different from what the dictionary says it means. I’m in the process of writing something about empathy and how people may be talking about different things when they use that word. It’s requiring a lot of thought and research, but I’d love your input on it when I post it (hopefully in the next couple of weeks). I like that you chose a definition that includes the phrase “intellectual identification” as part of empathy. So much of what I’ve seen implies that it should be somehow intuitive and the intellectual component adds something interesting to the discussion. I can often intellectually work out things that I can’t instinctively infer. I love fiction too! I also love writing fiction so I fail to understand the “lack of imagination” questions on AS tests. Perhaps the experts are confusing a preference for repetitive/organizational type play with a lack of imagination. But yes, small talk is confounding. Have you seen this study? http://www.ncbi.nlm.nih.gov/pubmed/16906462. Who Cares? Revisiting empathy in Asperger syndrome, Rogers et al. Thank you for sharing that! I just read the article and it helped me pull together a post I’ve been working on about empathy. Differentiating between affective and cognitive empathy is exactly what I was trying to describe but I couldn’t get past perspective taking vs. sympathy. Now I have the right vocabulary. Is it okay if I include a brief acknowledgement of your timely help after my post and link to your tumblr blog? It’s so helpful to have a little science to back up my rambley personal thoughts. That would be lovely n_n, really glad it was useful. The fact that you mention using scripts (those dozen phrases) at work says a lot. 🙂 I worked in retail for a while and found that I developed a work persona for dealing with customers that was almost like playing a part in a play. As long as everyone stuck to their assigned roles it was great! If you’re curious, some more reading might help you discover if share traits with others on the spectrum. For some people this matters and others just file it away in their “interesting things to know” file. Don’t cry! If it’s something that’s been on your mind for a long time, it might be worth doing some more reading or perhaps talking to someone about it. Before I shared my suspicions about my own AS with anyone, I was pretty stressed out by them. But once I started talking to people and reading more, I discovered that I’m still the same person I was. And now I have some knowledge to help me navigate the world better and understand myself more. I hope whatever you decide to do with your suspicions it works out well for you. Being an aspie is actually pretty cool. I got a 31 on the AQ test, but I am SURE I suffer from ADD and therefore find it hard to notice random details such as liscense plate numbers. I scored a 141 on the RAADS-R. Nice to know I not just like “Dory” from the movie Nemo for no apparent reason. 😛 I am still not sure if I fall on the Austism spectrum. But would be nice to have a explaination for some of my “weirdness” and deficiencies. Also, there’s either a high incidence of ADD co-occurring with ASD or the executive function deficits of ASD mimic ADD symptoms. Many people are first diagnosed as ADD/ADHD and then later receive an autism diagnosis when treatment for ADD doesn’t address all of their issues. Sorry, rambling! My score was also 41. Oh gosh, I do that all the time. I swear I delete more comments on other people’s blogs than I post. Thank you for letting me know that the blog has been helpful. 🙂 I swear there’s something about hitting middle age that breaks down our ability to pretend without ending up exhausted. I hope that you’re able to be yourself and to feel good about it, if now right away, then in time. My experience has been one of ups and downs as I move toward learning to be myself. Overall, though, it’s a very good thing. I finally took both the AQ and EQ in a clinical setting today, and the results are going to be sent to a specialist, so I’m finally on my way to a diagnosis (hopefully)! I’d already taken the AQ twice online, but never the EQ. As soon as I got home I decided to take both tests again to see my scores. I consistently score 42 on the the AQ, and I scored 16 on the EQ. I was very surprised by my EQ score, as I actually always thought of myself as quite empathetic, but oh well… It’s a good sign in terms of trying to get a diagnosis at least, right? Yes, scoring lower on the EQ will definitely work in your favor. I hope your results are favorable and you make it to the next stage of the diagnosis process. Fingers crossed for you! I scored 37… And in the four tests I’ve taken I’ve scored “more than likely”. So at 45 im a little behind the curve and running as fast as i can to catch up ,my score is 43. I am just getting to understand why things have worked different my whole life. Scored 44. Fits well with my attention déficit disorder aswell with my anxiety. Everything makes sense now. Hello, my score was always around 43 and i am a woman. o.O Well explains a lot. Kat you are obviously a very intelligent and self aware young lady. You should be proud that not only did you figure this out for yourself at a young age (I’m 36 and scored a 37), but, more importantly, you noticed you had a different reaction, not a “bad” reaction or “the wrong” reaction. I spent a lot of my life being very critical of myself of why I just couldn’t act or react to life in the “right” way. I questioned this for a long time and was lucky enough to find wonderful husband and supportive friends that helped me to see that my viewpoint was wrong, just different. Sometimes I might need an “interpreter” to tell me how other people might feel or experience but I also could bring innovative an enlightening view s and experiences to others. So keep being awesome and maybe some of us more mature individuals can learn from your self awareness and healthy perspective. I wish I had been so self assured and perceptive at your age. Well done! Well , I am 14 and received a 41 . Actually I always knew something was wrong anyway! Is it too high for a 14 year old?? Every time I’ve taken the AQ test, I score in the 30s. Last time, it was a 35. I don’t feel normal compared to my peers. I feel I have very different drives. I can’t connect to them. Every time someone tells me about aspergers, I think, that sounds like me. I took the AQ and get between 31 to 41 depending on how I interpret the question, 22 on the EQ and normal scores on FQ and SQ. RDOS shows mixed traits roughly 100/100 and the RAADS-R shows 140. Don’t know what that all means. Don’t want to pretend I have it, but if I do have it, I want an accurate diagnosis so I might be finally able to gain some understanding, otherwise, Im just a horrendous person. But the questions on this test are weird. Do I prefer going to the theater or the museum? I haven’t been to the museum in ages. I don’t choose to go to the theater. I accept peoples invites. I don’t invite anyone anywhere. I can switch off at the theater. I don’t know if I prefer the museum. I don’t even know what I enjoy anymore. I enjoy meeting new people? I guess so. But I can take it or leave it. Not bothered about it. I enjoy social occasions? I enjoy being with friends. Is that a yes? Im no good with remembering dates and numbers, but I remember passwords. Im drawn more to people than things? Before becoming a Christian, I’d have said things. But now Im trying to connect with people. That’s what Christians do. I feel obligated. All these “enjoy” questions. Define enjoy. What is enjoyment but a transient state? Can anyone give me a rundown on how to interpret these questions? And considering eye contact is such a strong indicator, why is that not listed as a question? I took the AQ test a few days ago. Partly for answers. I scored 42! A year ago I took the “Baron-Cohen” questionnaire and my partner filled one in from her perspective. I scored 9/10 on my own questionnaire Nd my partner scored me ten. I am still waiting, at 36, for a formal diagnosis still and find myself paralysed by indecision and a lack of direction due to being unable to get help without a formal diagnosis. Having spoken to a friend who works with ASD clients, he believes that I have BPD. although he readily admits that he is not a doctor. While my score of 33 is supposed to indicate Asperger’s, I’ve seen neurologists and psychologists and never been told I had it. I do construct walls of text with the oblivious perseverance of a spider constructing its own webbed asylum, which is one of the signs, but I only thought to check because my girlfriend wondered if I were afflicted. So many syndromes to manifest and sort. No wonder it seems nigh-impossible to make sense of everything we are. Im towards the upper extreme, recently scored 47 but even this raises more questions than answers. Going through diagnostic process. 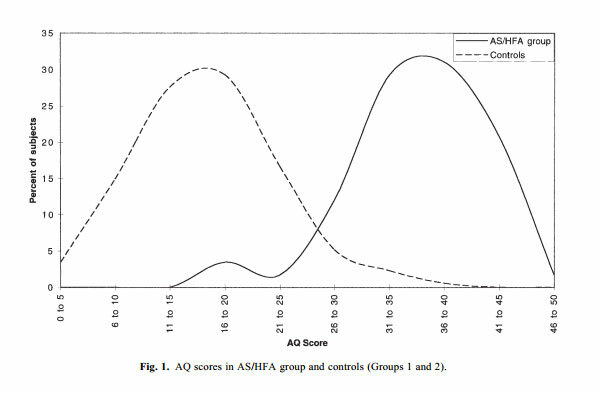 How reliable is the AQ because it makes it seem like I have really significant autistic traits. I’m curious as to whether you think that growing up in an abusive household would force an autistic child with above average intelligence to learn to read other people in a way which an autistic person that grew up in a ‘safer’ household might not? My score was 35-37 (2 answers were literally 50/50, depending on the circumstances), but when I looked over the questions and how they were scored, I noticed a pattern… when I adjusted my answers to what I thought they might be if I’d grown up ‘normally’, my score changed to 44-46. Has there been any research in this area, that you know of? My AQ score is 36, and my EQ score is 26/100. I am also a female so I guess that means my score is above the average score for a female with asperger’s.